Batesian mimicry is the process by which a palatable animal or plant species evolves to mimic an unpalatable animal or plant. The idea is that the predator drives natural selection by learning to avoid the unpalatable species, as well as things that look like the unpalatable species. One of the more well-known forms of batesian mimicry in the animal kingdom is mimicking of the venomous Coralsnake (Micrurus fulvius fulvius) by the non-venomous Scarlet Kingsnake (Lampropeltis triangulum elapsoides) vis-à-vis similar brightly phenotypical attributes of colored bands. Belonging to one of the two most venomous groups of snake in North America (the other group being the pit vipers), the Micrurus fulvius fulvius can grow up to 4 feet (120 centimetres) in length and is a denizen of lowland forests from North Carolina and Mississippi south to the coasts. Its distinctive patterns are generally considered to function as a warning signal of its potent venom, which can cause death through respiratory paralysis and suffocation (Smith, 1975). On the other hand, the Lampropeltis triangulum elapsoides is a non-venomous snake that seldom exceeds 24 inches (61 centimetres) in length. A native of the south-eastern United States, this species typically lives in pine flatwoods, where much of its time is spent secretively beneath logs or forest debris. As mentioned, the resemblance between the coralsnake, North America’s most venomous reptile, and its harmless near-twins, the scarlet kingsnake, is a classic case of batesian mimicry. Adopting the coralsnake’s colorful bands is a survival mechanism aimed at warding off predators who, after learning the hard way to avoid coralsnakes, would avoid scarlets as well (Pfennig et al. 2001). 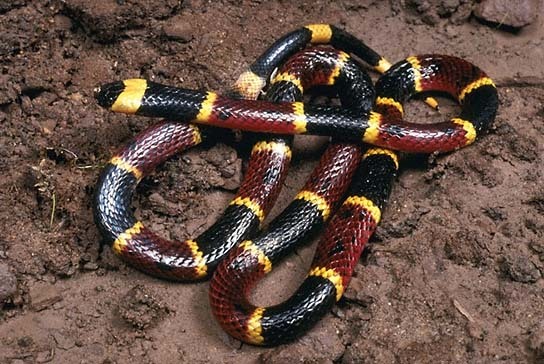 However, although both species possess colored rings encircling their bodies, their rings differ in order: coral snakes have a black-yellow-red-yellow ring order, whereas the scarlet kingsnake has a black-yellow-black-red ring order. This is due to a case of imperfect mimicry, whereby details of the color patterns are different from the model. As pointed out by Kikuchi and Pfennig (2010), perfect mimicry is simply not needed since the discrimination abilities of predators are not perfect. Red touches black, friend of Jack. Red touches yellow, kill a fellow! People who are color-blind, however, is best advised to take flight upon seeing such creatures. 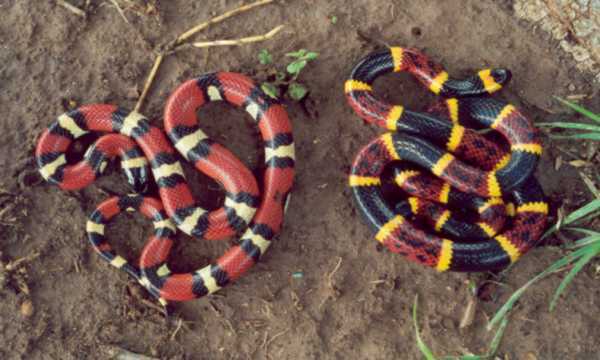 Picture showing a Coralsnake and a Scarlet Kingsnake. Can you tell which is which using the mnemonic device? “JCE Coral Snake vs Scarlet Kingsnake,” by gvanhelde YouTube Channel, 11 September 2011. URL: http://www.youtube.com/watch?v=FvDpbjSRpuc (accessed on 27 Mar 2013). Kikuchi, David W. & David W. Pfennig, 2010. 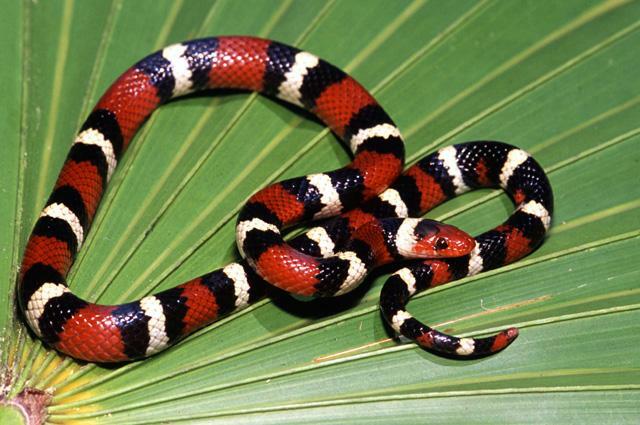 Predator Cognition Permits Imperfect Coral Snake Mimicry. The American Naturalist, Vol. 176(6): 830-834. Smith, S. M. 1975. Innate recognition of coral snake pattern by a possible avian predator. Science, Vol. 187: 759 – 760.